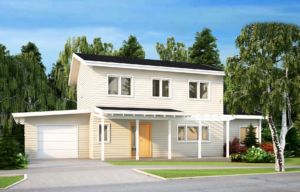 A new Net Zero home is being built on John Muir Loop by Better Builders of Oregon, and it is looking fantastic. This is a home that not only looks good, but has some rad green technologies for you and your family, too. Green tech is a snazzy term, but let’s unpack it a bit to better understand what it really means. There’s the ICF that it’s being built out of, which stands for Insulated Concrete Forms. Better Builders of Oregon has been using this green building technique for many years, and it’s been absolutely amazing to see the ICF go up like building blocks. The materials are made out of 100% recycled polystyrene. It’s insulating value is awesome. The envelope on this home is super tight and free of leaking air and drafts, making it extremely energy efficient, which will save you lots of money on energy bills and leaves a light footprint on the earth. The home is classic Pringle Creek Community style. With an open plan and plenty of windows that let light just spill into the rooms, it’s your own little urban oasis. There’s plenty of room to stretch out and be, for the kiddos, or extended family. A master on the main allows for both privacy and easy access to the kitchen for a late night snack or an accidental Netflix marathon of Stranger Things (Come on, you’ve gotta catch up on those seasons!). Another cool feature is that you can access the back courtyard from the living room, kitchen, and even your master bedroom. Imagine waking up, brewing a cup of coffee (or tea), and stepping out onto your patio to greet the sun. That sounds pretty nice. This wonderful home is available for purchase today! Interested? Please contact us for more info, or better yet, stop on by for a tour. 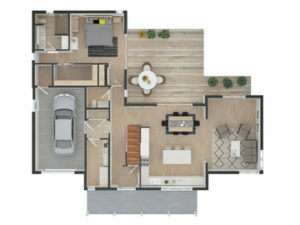 If you purchase the Net Zero now, there’s a chance you could decide on some of the finishes to make the home more uniquely yours. We are looking forward to hearing from you!